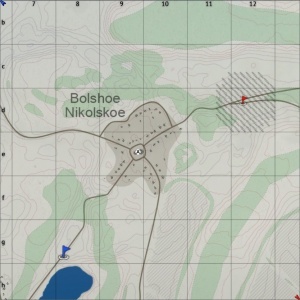 Volokolamsk is a ground forces map available in all modes. It was added in Update 1.57 "Battle March". The map consists of a series of small towns separated by open; snow covered fields, and dense forested areas; as well as some small hills. There are a number of small farm building clusters dotted around the map. A railway line runs in from the east, going down into and across the south of the map, before coming up through the east of the map. Most of the buildings in the map can be destroyed. In the west of the map is the town of Zhdanovo. The town has three main areas; in the west a road runs northwards through the town, there are a few buildings along the road, but otherwise the area is very open with few trees, and only gentle hills to provide cover, and separate the area from the rest of the town. The Middle of the town contains a small cluster of four buildings, a number of small hills separate the area from the rest of the town and provide cover for players in and around the area, providing a number of opportunities to go hull down. In the east of the town there are two building clusters separated by a narrow strip of woodland. A small hill separates this area from the middle of the town. To the west of the woodland combat takes place at shorter ranges due to the area being hemmed in by the hills in the area and the forested strip to the east. The area to the east of the woodland is more open, and combat can take place at longer ranges with players shooting each other from positions on the hills and ridge lines to the north and south of the building cluster. In the middle of the map is the town of Nelidovo. The town is formed around a "U-Shaped" road, with two roads coming off of it. The terrain in and around the town is extremely uneven, with many dips and hills forming ridgelines. The many buildings, fences and tree rows; in to town tend to force combat down to close range engagements, but players must be wary of enemy tanks hiding in the forests and ridgelines surrounding the town, as there are plenty of places from which players can fire into different parts of the town. Just to the south of the town there is a main road which runs from west to east across the entire map, linking up with Zhdanovo in the west and Stantsiya Dubosekovo in the east. To the south of this road there is a strip of completely open field, with only dips in the terrain, and the ridgelines they form, to provide cover for players. Further south there is a dense forest, streching from the western edge of the map and almost reaching the town of Stantsiya Dubosekovo in the west. To the south of the forest there is another extremely open area, which the previously mentioned train line runs through. Only a few small tree clusters and a derailed train provide cover in this area. The train line is raised up from the terrain, separating the very south of the map from the rest of the area. South of the train line the terrain is again extremely open, a road runs along the southern edge of the map linking up with the town of Stantsiya Dubosekovo. In the north of the map is the town of Bolshoe Nikolskoe. It is set at the meeting point of 4 roads, with a destroyed church in the middle of the town acting as a sort of roundabout. The terrain is, like in most areas of the map, rather uneven; the town itself sits on a slight hill, being slightly higher than the surrounding terrain, this is most noticeable in the north of the town where there can be a significant difference in elevation between the town and the edge of the forest to the north. The combat style is very similar to that in Nelidovo, there are several hills in the surrounding area which provide good shots into the town. Players can use the low ground to the north in an attempt to flank enemy tanks in the town. In the east of the map are the towns of Petelino and Stantsiya Dubosekovo. The town of Petelino consists of around a dozen plots of land (each containing one or two buildings), along either side of a single road. Immediately to the west of the town is a large dense forest, and immediately to the east is the railway line. The railway line runs along a raised embankment, player can cross the line and use the embankment for cover to advance past the town. The town of Stantsiya Dubosekovo consists of a few buildings and Dubosekovo railway station. To the west of the station are a series of trench fortifications and destroyed German tanks. The fortifications are meant to be a recreation of those used by Panfilov's Twenty-Eight Guardsmen. This area is extremely open with very little cover. 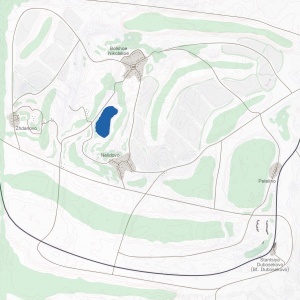 The towns seen in the map are all real towns, in an area approximately 7km (4.3 miles) southeast of the town of Volokolamsk. The general layout of the map is reasonably accurate to the layout of the real life towns; although the exact road layout and route of the train line are different in real life. The map was made in collaboration with the film crew of Panfilov's 28 Men, a war film based on the Soviet propaganda legend of Panfilov's Twenty-Eight Guardsmen (a group of 28 soldiers who defended Dubosekovo railway station, during the battle of Moscow). According to the legend on 16th November 1941 28 Soviet soldiers made a heroic last stand in the defence of Dubosekovo railway station, against a large German assault, destroying 18 of the German's 64 tanks and killing 70 German Soldiers, before being all being killed in combat. Heavy fighting by men from the Red Army's 316th Rifle Division did occur around the station at Dubosekovo, however the details of the fighting (and that the 28 men made a heroic last stand) were fabricated by Vasily Koroteev and Aleksander Krivitsky, journalists for the Red Army's newspaper "Krasnaya Zvezda", in an attempt to boost morale. The Legend spread and on 21 July 1942, the 28 Guardsmen were all posthumously awarded the title "Hero of the Soviet Union". In 1942 and 1947 soldiers named among those listed as dead in the legend were found alive after being arrested; this prompted an investigation into the story. Four more soldiers listed in the legend were found to be alive and in 1948 a report declared that the last stand of the 28 men "did not occur. It was a pure fantasy". The area around Volokolamsk saw heavy fighting as part of the Battle of Moscow. On 30 September 1941 German forces commenced their offensive on Moscow and by mid-November they were within 100km (62 miles) of the USSR's capital. German forces launched an attack on Volokolamsk, which was being defended by the Soviet 316th Rifle Division. Volokolamsk fell on October 27th 1941 and the 316th were forced to fall back to the east of Volokolamsk. The Division’s 1075th Rifle Regiment set up defences at Dubosekovo railroad station. On the morning of 16th November they were attacked by the German 2nd Panzer Division, and by 10am (Moscow time) the German forces had control of the villages of Petelino and Nelidovo. It is reported that they managed to destroy "some" tanks and suffered over 100 casualties. Volokolamsk was liberated on 20th December 1941 by the 331st Rifle Division. The Battle of Moscow ended in defeat for the Germans on 7 January 1942. There are three capture points. 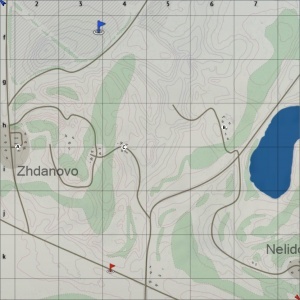 (For AB and RB) the battle area is restricted to the town of Zhdanovo in the west of the map. Point A among some buildings in the west of the playable area, B is in among some small farm buildings in the east of the playable area, and C is among some buildings in the middle of the playable area. In SB the battle area is nearly the entire 4km x 4km map. 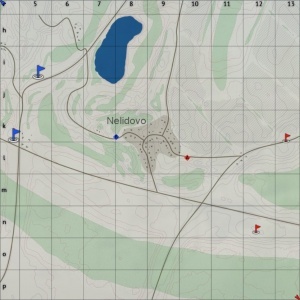 One capture zone is in the middle of the town of Nelidovo (in the middle of the map) and the two other points are among farm buildings to the east and west of the town. There are three configurations of the conquest mode, each with one capture point. 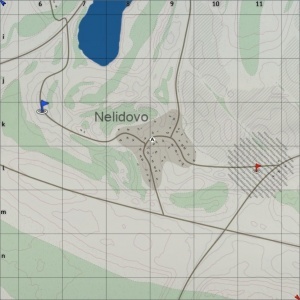 The Conquest #1 battle area is in the middle of the map (around the town of Nelidovo), with the capture point in the middle of the town. In Conquest #2 the battle area is in the north of the map (around the town of Bolshoe Nikolskoe), with the capture zone at the church, in the centre of the town. 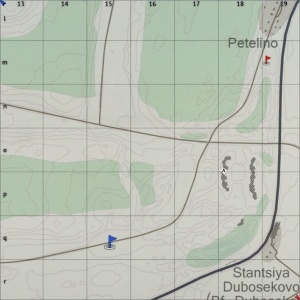 Finally in the Conquest #3 configuration, the battle area is in the southeast of the map (around the rail station at Stantsiya Dubsekovo), with the capture point in the open, at a set of trenches in front of the station. There are two capture points, each owned by one of the teams. The battle area is in the middle of the map (around the town of Nelidovo), with the capture points in the east and west of the town.